McGregor was making his professional boxing debut having moved over from UFC and fared better than most people thought, winning the first few rounds. 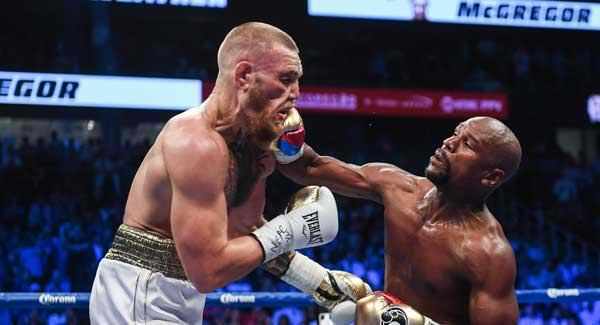 But Mayweather’s class and experience began to tell and, with McGregor barely able to stand in the 10th round, the referee stopped the fight. Mayweather said in his post-fight interview in the ring: “He is a tough competitor and I thought we gave the fans what they wanted to see. “He is a lot better than I thought he was, he used different angles and was a tough competitor but I was the better man tonight. McGregor will walk away with his reputation intact after putting up an accomplished showing in his first professional bout. The 29-year-old believes the referee Robert Byrd called time on the fight too early. “I took the early rounds fairly handy,” he said. “I thought it was close, I thought the stoppage was a bit early, there was a lot on the line and I thought he should have let me carry on.